Home / Holidays/Celebrations Art / Mother’s Day Card Using Rose Fan, Lg. Mother’s Day Card Using Rose Fan, Lg. “Rose Fan, Lg.” was stamped on acetate with permanent ink and glittered from the back side with Art Institute glue and glitter. 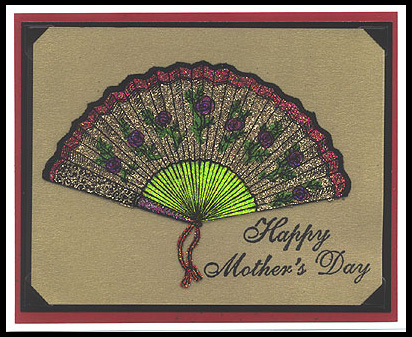 “Happy Mother’s Day” was stamped and embossed with black embossing powder on gold card stock. The acetate piece was layered directly on top of the 5 1/2″ x 4 1/4″ gold piece. Black glossy, red confetti, and white card stock were cut incrementally, each to be 1/4″ larger than the previous color. Black photo corners were adhered to the black card stock and the gold and acetate pieces were slipped into the pockets. Acetate fan made by Davetta Alexander. Card made by Margaret Wiggin. Tags: Acetate, Embossed, Glitter, Happy Mother's Day, Margaret Wiggin, Photo Corners, Rose Fan Lg. Previous post: Mother’s Day Card Using Bouquet, Lg.